Using handprints is a fun way to create many different types of craft projects for children. I have a book at the school that I will have to get and let you know where it's from. We get many cute projects from the book. 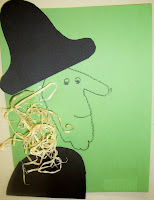 I have a couple of Halloween handprint crafts to share with you. 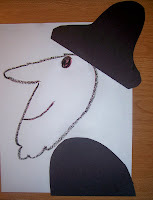 These were done in our Pre-K rooms. 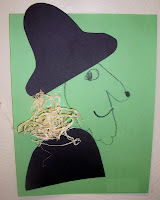 If you look at the project you will see the first thing to do is to trace the children's handprint on the green paper, if they are older they can do this themselves. (I didn't have greenpaper on hand.) 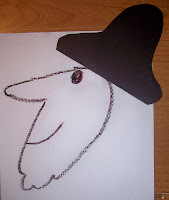 The hand must have the four fingers together, and the thumb would stick out--for the witches nose. 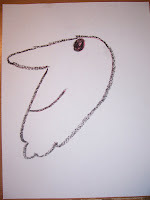 Then allow the children to draw and eye and mouth, a few children even added a wart for the nose. 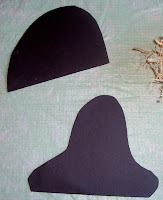 There are two general shapes that you will need from the black construction paper. One is a hat shape, the other is the top of the outfit shape, it looks like a little mound. 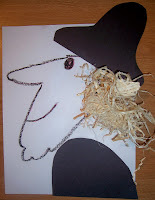 Here again, you may have these drawn and let the children cut them out, or you can allow them to come up with what types of clothes' shapes they would enjoy and let them cut them out, or you can have them cut out already for young children to glue on. The hat gets glued next to the part of the hand that is the palm--this is the top of her head. The "shirt" gets glued behind the pinky finger--you try to let the fingers show to simulate a chin. After those pieces are in place, you add the hair. 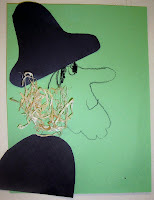 Our teacher used a straw-like product called Excelsior she got from a craft store. You could use yarn too--anything that looks stringy. You might have to use some tacky to make sure this sticks well. There you have it a wonderful witch to help you celebrate Halloween.